For those of you who follow me on twitter, you may have seen how stressed out and panicked I was getting the closer we got to the wedding day. I was waking up to stomach aches EVERY morning for months. It was making me literally sick! I had so many worries! Would everyone have fun? Would everything look right? Will guests be offended if I don’t make this the most personalized unique magical affair ever? The ceremony was beautiful. 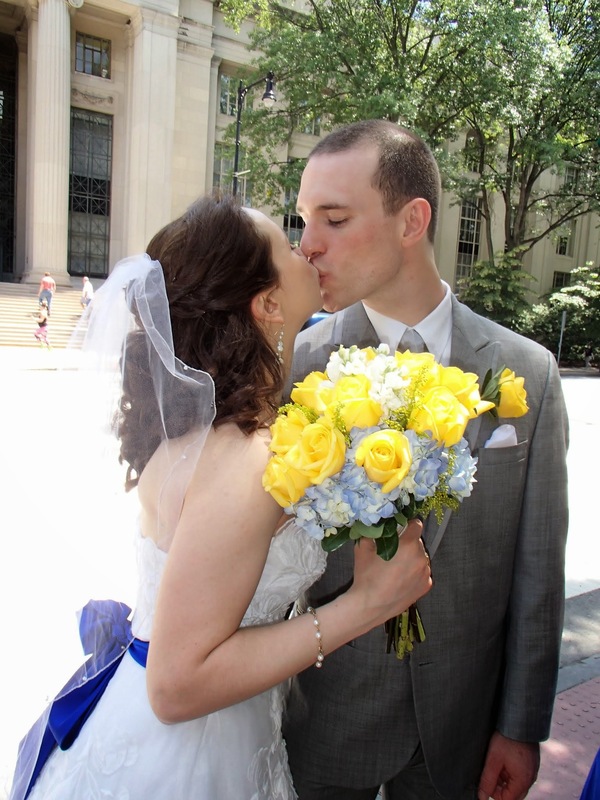 We got married at the MIT Chapel (where my parents were married back in the day!). That place is really cool inside (see above picture). My older sister sang all of the music (she’s an amazing singer) and I only cried a tiny bit during the ceremony, when she hit the high note of a beautiful rendition of the Lord’s Prayer. The reception was at Sacco’s Bowl Haven and Flatbread Company (AKA Flatbread Somerville). Yes. 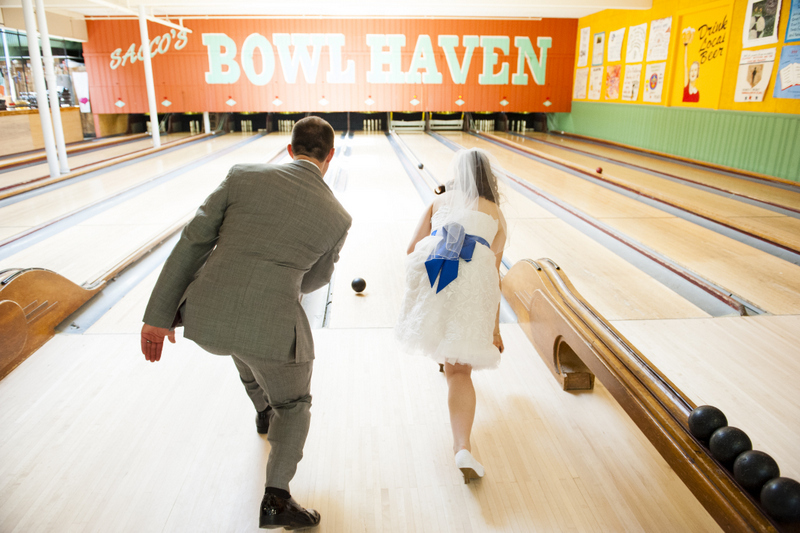 Our wedding had candlepin bowling and flatbread pizzas. Remember when I took my sister and brother-in-law to a bunch of our favorite local restaurants? Well, Flatbreads is definitely one of our favorites, so when we inquired about hosting our reception there, and they said yes, we were overjoyed! Besides the pizza and salads, we also had lots of delicious appetizers for the guests, and they could enjoy all of the tasty beers and cocktails that Flatbread offers. And instead of a champagne toast (because, really, who needs a champagne toast?) we had a Bantam Cider toast! Everyone got a champagne flute of Wunderkind to toast to us after my new brother-in-law gave a fun toast to us! I loved how everyone at the reception interacted and met each other. Our different friends from all different times in our life, our own extended families, all got to dance and bowl with each other! So much fun! We cut the cake, but decided not shove it into each other’s faces. It was still insanely delicious! (in case you were wondering, it was carrot cake from Modern Pastry in Boston. Also, we bought way too much. We still have that entire 8″ diameter top piece sitting in our freezer! 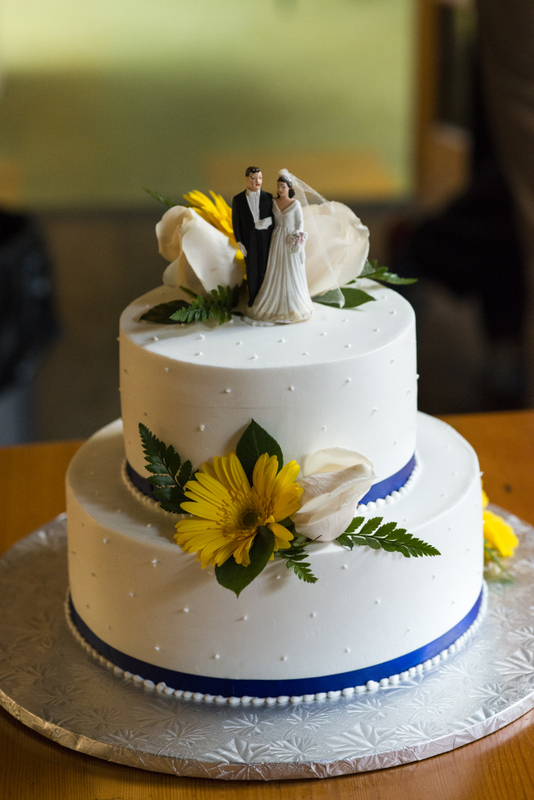 And had most of the 8″ diameter remaining underneath that we had to eat post-wedding, too). After the reception was over, we headed back to the hotel to regroup, before we and a smaller group of guests went on a bar crawl. Do you know how fun it is to go on a bar crawl in a wedding dress with your new husband? It’s awesome. Everyone congratulates you. And you look super amazing. We left the hotel bar, then made stops at The Asgard, The Field, The People’s Republik, and ended the night at Dumpling House near Harvard Square. It was a long day (setting my alarm before 6am, then my body deciding that 4:50am was a good time to wake up) but it was definitely one of the most fun and happy days of my life. It was great to have all my family and friends there to share in our day, and I got to marry a pretty awesome guy. So, what did I miss? Any questions for this newly married lady? For more photos, check out our photographer’s blog! For those of you curious, here’s a list of the vendors we used to make our wedding a success. We could have gone super DIY for this wedding, but I think all of these people were worth it! I don’t usually touch on my academic background in the blog. I tend to talk more about personal finance, with a bit of food and Boston talk thrown in. And I guess general musings about life after graduation. But today I’d like to talk about Materials Science and Engineering. First off, I studied Materials Science and Engineering at MIT. I originally was going to major in Chemistry or Chemical Engineering, but the more I looked at the majors, the more I realized Materials Science and Engineering was the place for me. It’s a great combination of Chemistry, Chemical Engineering, Mechanical Engineering, Aero/Astro, and really, lots of science and engineering majors. I think I often find myself urging others to pursue Materials Science and Engineering, or at least science/engineering in general. And my new job gives me plenty of ways to share my love of science, engineering, and my scientific background with others. I went back to MIT for their Career Fair and talked to students about my job and what sort of work I do. And I went to an event for women in engineering, where high school girls interested in science and engineering came together and learned about future career opportunities. I really like telling people about all the cool things that you can do as an engineer or scientist. Maybe that makes me a geek! So, I think I’ll post every once in a while about materials and such. It’s something I’m really interested in! And I’d also like to mention that, while I’m not a career adviser or anything, if you have any questions about college/careers in science/engineering, let me know. I know it sounds lame, but I really like helping people. And so if there’s a student who wants to know more about colleges or majors, I’d be happy to help. So, stay tuned for more posts, likely with more reasons for why I love materials! p.s. A really cool resource out there is OpenCourseWare, a program through MIT where material from classes taught at MIT is posted for anyone to read/watch/listen to for free. Check it out! And since I’m promoting Materials this week, you should definitely look at the courses listed under that major. (especially 3.091, an extremely popular class at MIT. The professor, Donald Sadoway, is an exceptional scientist and lecturer, and the class is a good start on the topic). So, I graduated from MIT back in 2006. My sister is a current student there, so I just gave her all my books (so she can use them/sell them to others). There’s a few sites to buy/sell used books specifically at MIT, in addition to the usual Amazon.com and half.com, such as…bookx (MIT Personal Certificate required), MIT 412, CampusBeacon, or emailing around your dorms (which is highly frowned upon). At any rate, no one ever bought any of the books from her. So, finally, we went in and sold my books back. All I can say is, I should have sold them back a long time ago. I held on to so many books with the assumption that I’d use them again…and that never happened. I took the tradeoff between getting more money for the books and the hassle of posting the books to amazon or something and finding storage space for the books and just sold them back to the school bookstore. The COOP is notorious for selling books at high prices and buying back books at little to no money. They also don’t buy back old editions. And since I sat on selling books for so long. I got a grand total of…$50.75 for perhaps 10-15 books. Which means I barely got any money back. But it’s something…and is a reminder to me that I should stop procrastinating. I still have a few books left over that I may try to sell online or just donate…maybe get a tax benefit for that? That’s pretty much it financially right now. I am thinking about moving money from my emergency fund to pay down my student loans…but again the procrastination is hitting me. Gotta get better at this!